When I last updated this blog I had promised myself that I would not let too much time pass before updating it again. Alas, I have broken my promise again. As much as I wanted to keep it, life, once again, got in the way. Let's recap. The holidays were busy, but great, our biggest challenge this year being the weather. The bitter cold started much earlier this year, so we were unable to do some of our traditional outings. The Christmas market is no fun at -20 degrees or closer, neither is a walk around town to admire Christmas decorations. We will make up for it next year. This lack of outings and dreary weather have also resulted in very few photos being taken. Thank you polar vortex! I certainly have some serious catching up to do. 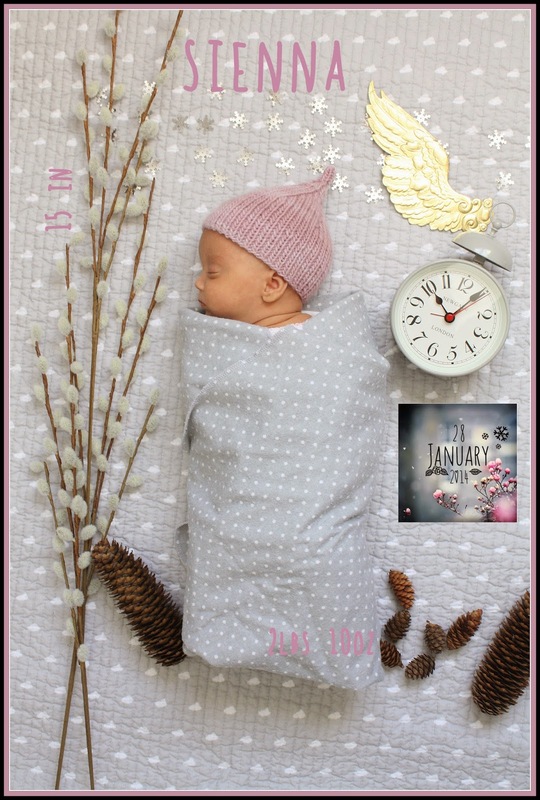 And just as I thought that I'd get a fresh start in 2014, my baby daughter decided to make her appearance 3 months early! I spent my days by her side, at first struggling to keep positive, then cautiously optimistic as she started improving. We worked hard to keep a routine going, mostly for my son, but also for ourselves, to help us keep our sanity. It has been an emotional roller-coaster, having felt panic, paralyzing worry, guilt, helplessness, but also euphoria and happiness. Through it all, one thing has helped me cope, and that is the wonderfully calming effect of my knitting needles. Well, ok, to be honest also the occasional glass of wine and massive amounts of chocolate. She has now been home for 2 weeks and a new stage has begun. A new routine, getting to know each other and lots of cuddling. For today I wanted to share a glimpse of my precious baby girl. Soon, I will share some finished FO's. Monica, I cannot wait to actually meet her in person. I feel though, that I know her so well already, even though I haven't actually met her. Sienna is a fighter and she is beautiful. Enjoy your time off with her and don't forget to cuddle her often for me. You certainly know her, though you've never met, I agree. Cuddles it is, and I can't wait to bring her to the Wool shop! Wow Congratulations Monica. What a journey. My son was 8 weeks early, so I know some of what you 've been through. What a strong mama you are! She is absolutely beautiful! Thank you Anne, you certainly must know, I am glad the hardest part is behind us. we love her, and pray that she soon will walk :) hang in there !